Gone are the days when you had an old classic radio that worked just fine when you wanted to listen to some songs. You had to adjust to your favorite frequency channel manually and that too wouldn’t be a great music experience because of all that static noises it always made. Still, you feel nostalgic about those days and memories revolving around radios, right? First TVs and then the internet happened and it killed the need for radios but anyways we will always have a special place for those memories and those radios. We can’t just forget those times because they have been a part of our lives at some point in time. Bosch has come up with yet another innovative product and this time they have taken the classic old radios to a whole new level. Not only the older generation can have their familiar “radio-feels” with this product but the newer generation can also have a proper music system for their rocking house parties. It is basically a win-win for everyone in the house. Here in this post, we will be discussing in detail everything about the product which will include – a brief description, features of the product, pros&cons, frequently asked questions about this Bosch product and for your convenience we have included some customer reviews too. Hope this post helps you to decide whether this radio is “the one” for you or not. Keep reading to find out. Follow through this brief description and you will have a basic idea about the product and then it is up to you to decide whether or not you want to continue reading this post to get more details about this product or simply skip to your next choice. This radio comes with inbuilt Bluetooth technology and with the help of this you can connect it your smart device and play music already stored in your device or you can stream online radio. This Jobsite radio is great in performance and sound quality and the best part is that it is portable too. It is very durable and has 4-way speakers along with a subwoofer which provides sound in all directions. It is made with a strong and durable aluminum or rubber cage which makes it resistant to any kind of weather conditions. You also get a USB port with this product which is quite helpful. It can be powered via 18Volt DC batteries(Li-Ion) or directly from an AC outlet too. The inbuilt charger in this radio can be used to charge these Lithium-Ion batteries as well as another tool also, which can be connected via 4 outlets present. 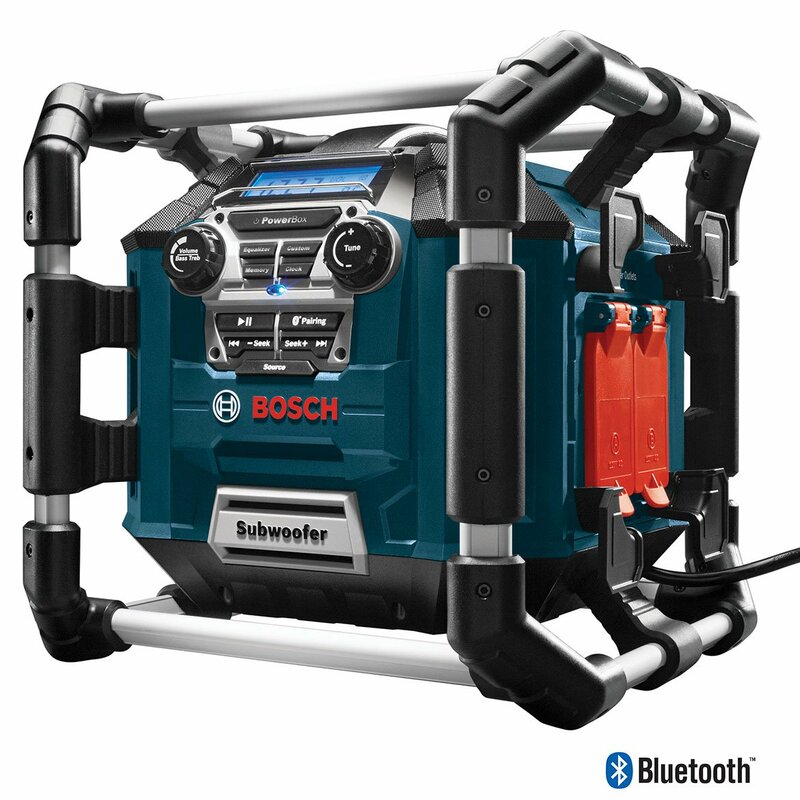 It is a Bluetooth powered jobsite radio and it enables you to connect it to your smart device and play songs from your stored files or play internet radio. The Bosch PB360C consists of four-way speakers and also a subwoofer which provides great sound quality in all directions. The rubber or aluminum cage around it makes it safe from any kind of weather conditions. There a 4 power outlets which can be of great use to you in case you want to charge your garage tools with the help of this radio. You can use this radio by plugging it into a direct AC socket from the wall or it can also run on the Li-Ion batteries. Bluetooth features make this radio a complete music system. Sound quality is good but not very loud. Can run on Lithium-Ion batteries as well as Ac power. What the difference between the PB360C and the PB360S and which one is louder? 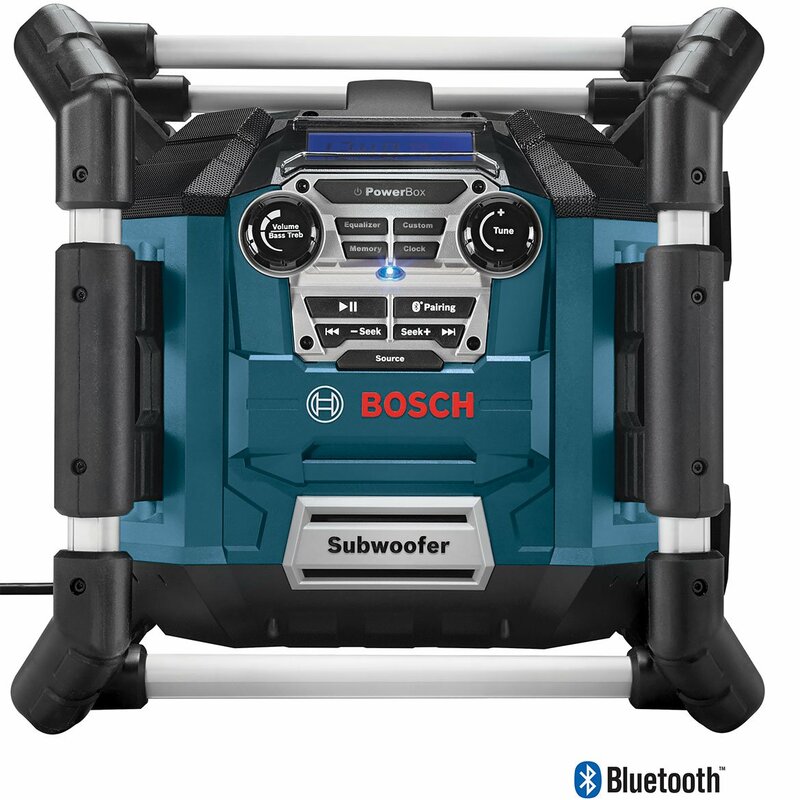 Answer: Bosch PB360C and PB360S are both exactly the same except for the additional Bluetooth feature in the C variant. Also, the sound quality and loudness in both these products are the same. Is it okay to plug in 4 different tools all at once in the power outlets provided? Answer: Yes, it is completely okay to plug in 4 tools in the power outlets at once but depending upon the tool type, it may not be able to run all the tools together at full power otherwise you are okay. Answer: No, it does not come with a CD Player but you have Bluetooth and also an Audio Jack which will pretty much cover for it. This product launched by Bosch has really helped me with my lifestyle since I bought it. Not trying to sound too extreme but I love music and I work as a handy man, so it is a perfect match for my workplace. The build quality is great and I must say it has survived many hits, which was more than I expected and also the sound quality is great too. I loved this radio. For me this has been my best buy in a long long time. I love listening to baseball and other sport commentaries while working and this radio has helped me so much with its awesome radio reception. I love the part that I can also charge my cellphone which almost dries out daily because I forget to charge it at night. 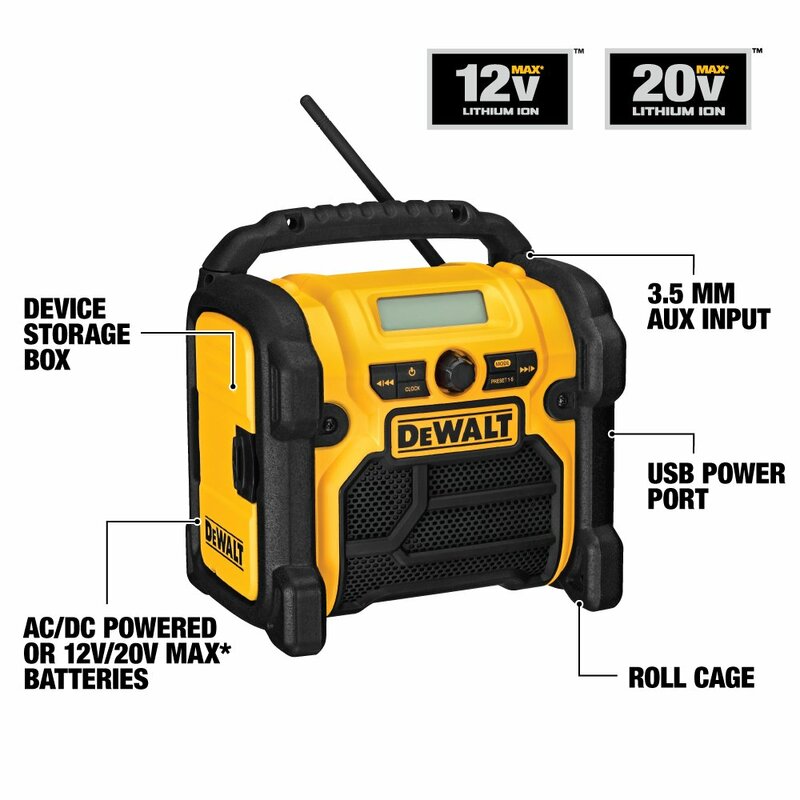 If you are not into VERY loud music then this radio can be your perfect job site companion. Having 4 power outlets is the most amazing part of this radio. It pros heavily outnumber its cons because that is how amazing the BOSCH PB360C is. After reading all the features and reviews it will help you decide better whether it is good for you or not. If you still have any queries left, you can ask them in the comment box provided below.